Sailing is a great activity and sport for all ages. For over 45 years, the US Sailing certified instructors at the Hoover Sailing Club Sailing School have been teaching children and adults how to sail. 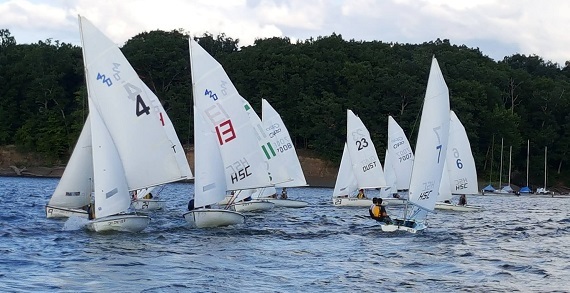 Hoover Sailing Club Sailing School offers an array of classes and racing teams designed specifically for different ages and levels of experience. Courses provide the opportunity for kids and adults to develop the skills and confidence necessary to enjoy the sport of sailing. Class size is limited, so sign up early! Offered for children ages 7 and up, Hoover Sailing Club Learn to Sail youth sailing programs are designed to teach not only sailing techniques, but personal responsibility, teamwork, water safety and sportsmanship. Hoover Sailing Club Learn to Sail runs several one- and two-week beginner, intermediate and adventure sailing classes, as well as 8 one-week racing classes for kids over the summer. All daytime classes run from 8:30am to 4pm Monday through Friday, rain or shine, making it a great alternative to traditional summer camps.